The thyroid gland affects almost all of the metabolic processes in the body, and these thyroid disorders can range from a small, harmless goiter that does not require any treatment, to life-threatening cancer. 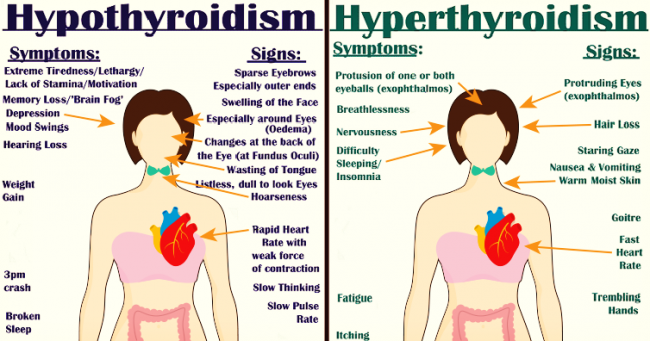 The most common thyroid problems involve abnormal production of thyroid hormones, hyperthyroidism, and hypothyroidism. Graves’ disease: The excessive production of thyroid hormone. It leads to symptoms such as anxiety, muscle weakness, trouble sleeping, nervousness, and accelerated metabolism. Thyroid disorders are usually diagnosed via a blood test and are usually treated with some prescription drugs like levothyroxine, synthetic hormones, and many other anti-thyroid medications. However, the first step towards better health and relief in the case of thyroid disorders is to do some lifestyle and dietary changes.